Growing up, my idea of a date night was usually dinner and a movie. As I got older, my interests have changed and I like to vary it up a bit. One of my current passions is attending a live music event. It doesn’t matter if I know the band or not, it’s the fact that my senses become heightened. 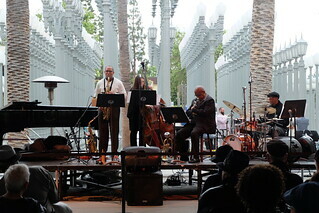 My wife and I recently attended Jazz Nights at LACMA, for which Ray's and Stark Bar recently started a picnic basket program. 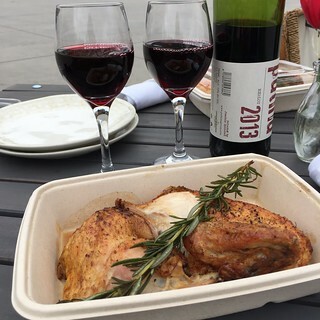 There are two options to choose from: The Duke ($40) which comes with a whole roasted or fried Jidori chicken with sides and dessert, and The Louis ($100) which comes with the above along with charcuterie, a bottle of wine, real china, a fold-out table, a picnic blanket, all nicely packed in a wicker picnic basket. . To experience Ray’s and Stark Bar’s new Jazz Nights picnic basket program, I preordered the “Louis” thinking that the culinary experience with the live music would be a nice date night for us. 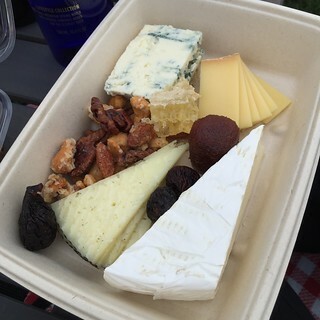 Our picnic basket arrived promptly at 6pm. We were directed to a grassy area where there was a table, blanket, and two red cushions. A bud vase with a flower and a candle nicely finished this thoughtful presentation. Looking at this, I thought that it was nice that they did the work for me and I didn’t have to carry everything from my car! 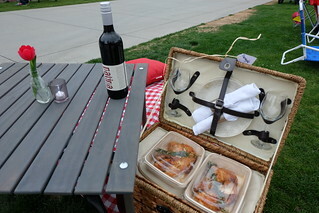 The picnic basket was assembled in an impressive way. The first thing my wife said “Can we take the basket home?” They included real silverware, cloth napkins and real wine glasses. The lack of paper plates and plastic forks made for a classy experience. Two containers of roasted rosemary chicken were on the top. The chicken was tender and roasted to perfection. The rosemary sprigs gave off an extremely pleasurable fragrance. Opening the inner compartment reminded me of going through a Christmas stocking. 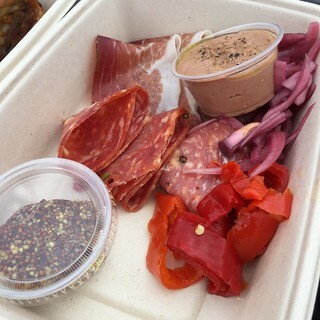 The charcuterie was first and it was quickly followed by an assortment of cheese, nuts and dates. I couldn’t help myself with gathering up a mixture of blue cheese, honeycomb, candied nuts. The combination of salty and sweet was addictive! 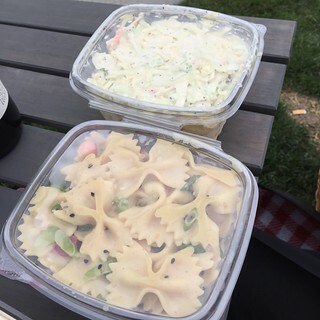 Containers of pasta salad and cole slaw was next. I was surprised with the pasta salad. It was prepared with an Asian twist: toasted black sesame seeds and a delicious miso based dressing. 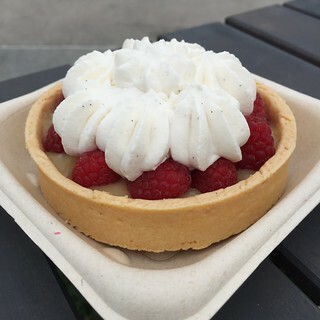 For dessert, there was a fresh raspberry tart. While we indulged ourselves on the “Louis”, you can also get the smaller basket, the “Duke”. Like the “Louis”, you can select between roast and fried Jidori chicken. 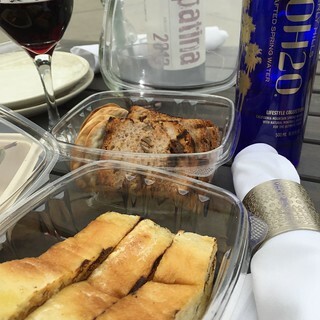 A bottle of their Patina chardonnay or merlot is also available at an additional $25. Both my wife and I enjoyed people watching that evening. 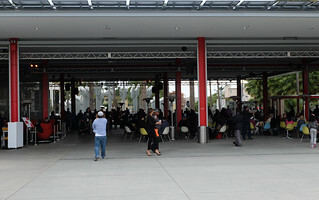 Tourists, people dressed in work attire, retired individuals and even young families were smiling and enjoying the open-air entertainment. The acoustics were better than I expected and CJS’ Quintet delivered classic jazz to everyone’s enjoyment. I was amazed to hear that one of the band members played the flugelhorn. We told our daughter about our experience and the first thing she asked was whether we saved any of the raspberry fruit tart for her. She surprised me by saying that she would like to go with us on a future outing. Since she watches Henry Fonda movies, maybe she’ll enjoy classic jazz? What I loved most about this evening? I got to fully utilize all of my senses: touching, seeing, tasting, smelling and hearing. I definitely recommend it for a date night on the town. Disclaimer: This event was hosted.